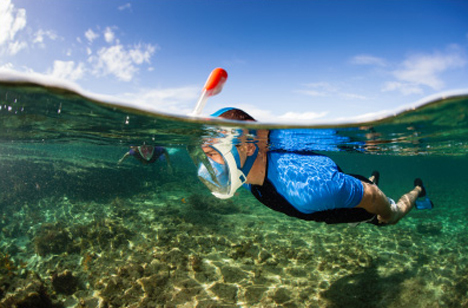 Snorkeling is a one-of-a-kind experience, but it can also be a little intimidating. Many people are used to breathing in through their noses and out through their mouths, which isn’t possible with traditional snorkel gear. 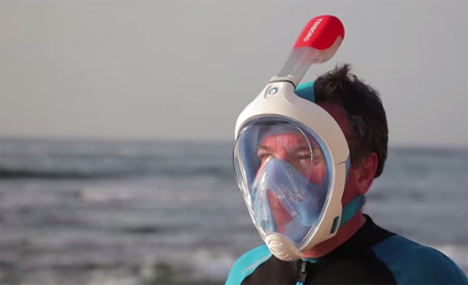 The Easybreath mask from French company Tribord totally redefines the snorkeling mask. 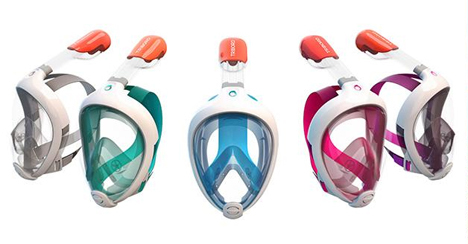 The Easybreath fits over the entire face, allowing snorkelers to breathe normally and offering a 180 degree view of their surroundings. A double airflow system – just like a miniature domestic extraction fan – prevents the inside of the mask from fogging up and obscuring the wearer’s vision. The top of the snorkel features a mechanism that plugs the tube’s opening when it is submerged. When you are simply swimming around and enjoying the underwater sights, however, the top of the snorkel is brightly colored to make it visible to swimmers and boaters. The design is so innovative that it won first place at the 2014 Oxylane Innovation Awards.